I am in no way a sewer. So for me to be able to whip up some bow ties for Ref and for little money and not much time, that shows just how easy it is. Over the last 12 months I have made numerous bow ties and have worked out the best way for it to look half decent and not fall apart, unlike the first one I made. 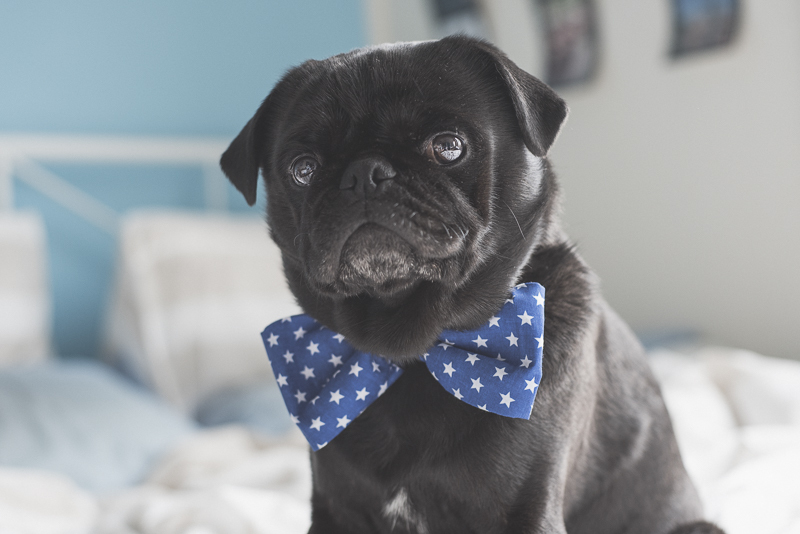 And since pugs in bow ties are awesome, you no longer have to worry about sourcing bow ties when you can whip some up in no time with this DIY Bow Tie quick and easy tutorial. You will need your favourite fabric, a pair of scissors, a piece of elastic, a needle and some cotton thread. Cut your fabric into a rectangle. Any size will do as long as one side is longer than the other. 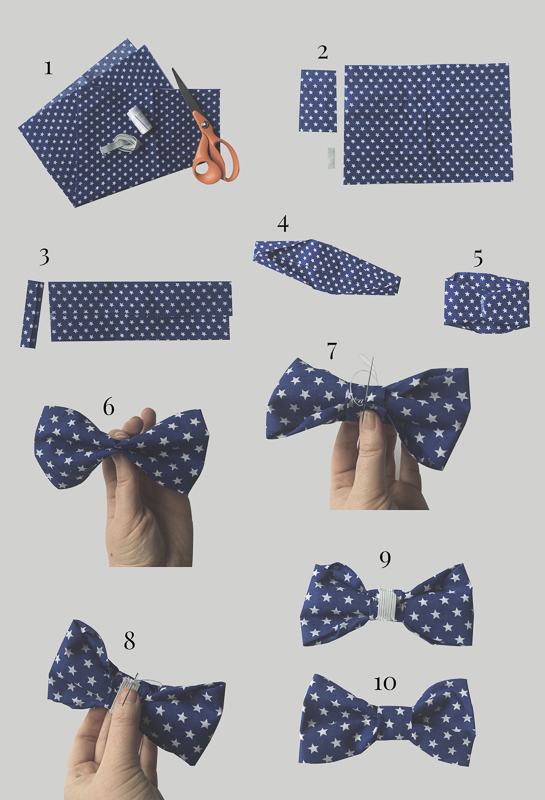 If you want a larger bow tie, cut a larger rectangle. 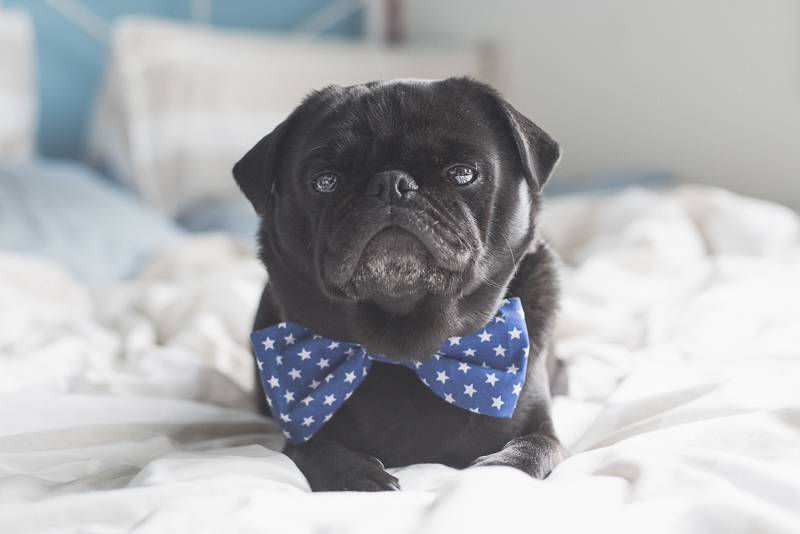 Likewise with a smaller bow tie. Then cut a strip about 2cm wide off the end, cut that in half again. You’ll use this to hold it altogether. Fold the longest edges of both pieces of fabric to meet at the centre. 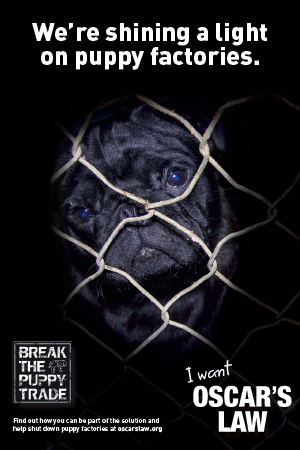 You may want to iron the edges to help hold its shape. On the larger piece of fabric, fold the corners in slightly. Fold the ends in to the centre. 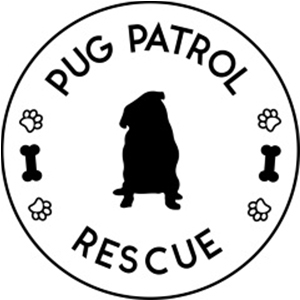 Here you may want to put in a couple of little stitches to hold the two ends together in the middle so it doesn’t come undone when your pug shakes whilst wearing it. Pinch the middle of the fabric to form the shape of the bow. Using the small piece of fabric, roll it around the middle of the bow at the pinch to hold it altogether. Stitch the edge of that the piece at the back of the bow tie to prevent it from falling apart. Stitch the first side of the elastic to the back of the bow tie in the centre. The second side of the elastic needs to be stitched so that there is enough room for a collar to slip through. 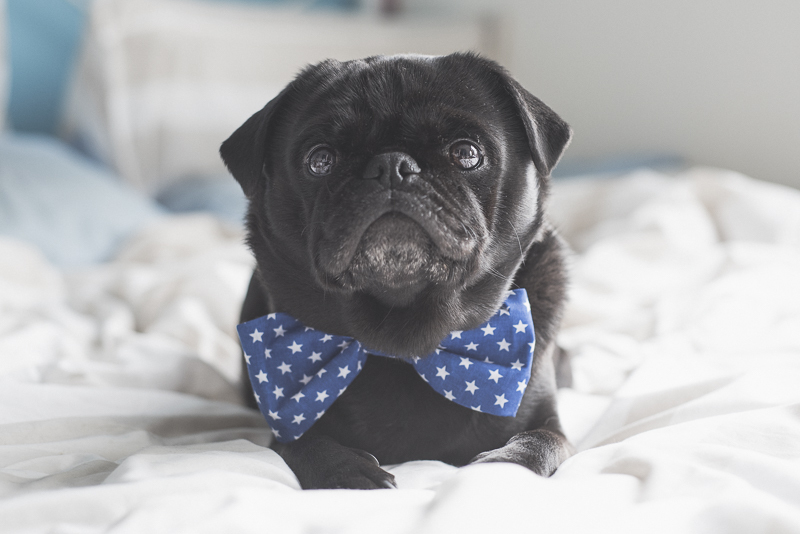 Your finished bow tie! Awesome job! 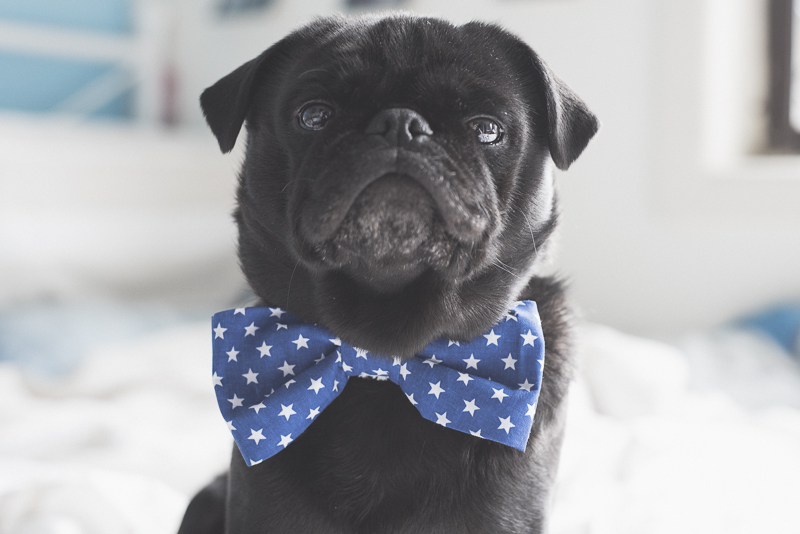 The most important tip I can give you in this tutorial is to have some fun creating cheap and fun bow ties for your pug. 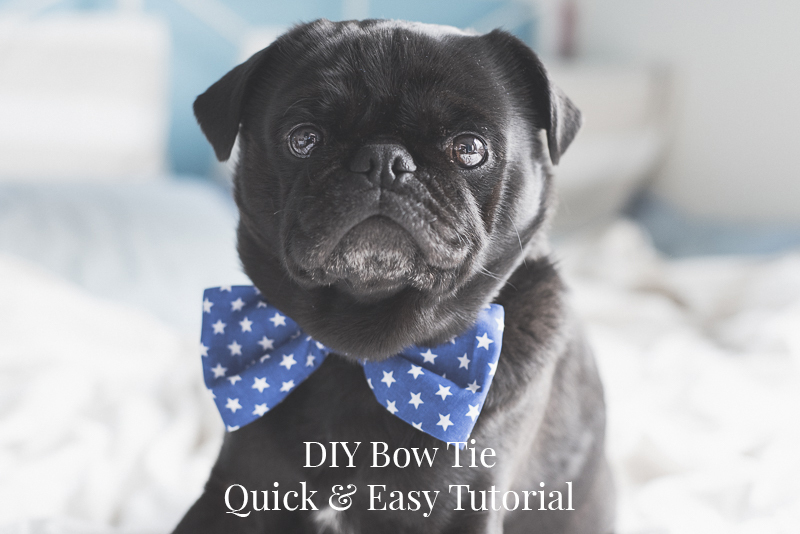 I would love to see how you go with your bow ties so be sure to post them on Facebook or Instagram and don’t forget to check out other DIY projects on the blog.